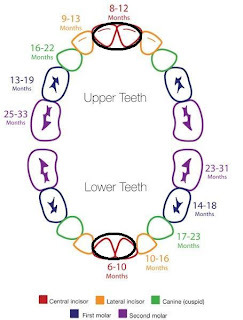 I recently had a discussion with my health visitor as I was curious about what stages Maxwell's teeth would come through. The health visitor was very vague and told me all babies teeth come through at different times. 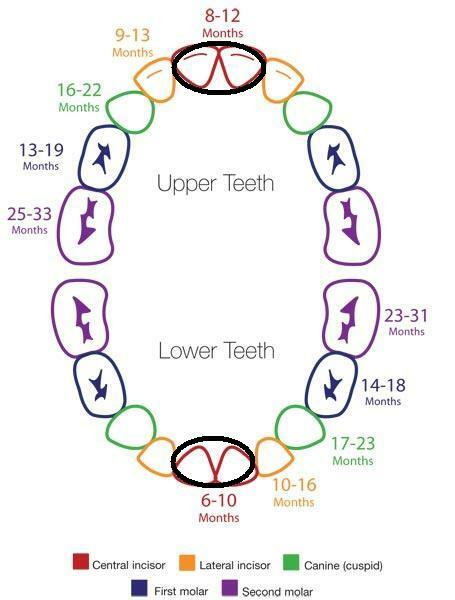 I have been following Nuby over on Facebook, and was delighted when they posted this image about what ages babies teeth come through. I have highlighted the image, with what teeth Maxwell already has. Maxwell's teeth came through slightly different from what this diagram shows. Maxwell's upper teeth came through first followed by his 2 lower teeth. At the present moment there are no visual sign of any coming through but he does seem to be in pain with them. Maxwell has never caused a huge fuss whilst his teeth have been coming through, however he is a huge fan of the Nuby teething range. We first brought other brands of teething toys but none of these worked. Then one weekend Nanny came barring gifts for Maxwell. She brought us the IcyBite Keys and the Bugaloop teether toy. I then decided to buy the Nuby Nibbler after hearing great reviews from other Mum about it. I think the Bugaloop Teether is Maxwell's favourite toy. This teether was the only teether Maxwell liked when he was smaller. Most other teethers we tried were to big, a horrid shape for him to fit in his mouth and too heavy to hold. However when he was smaller he was always able to hold it well and lift it up to his mouth without any help. Now Maxwell is older he still loves this toy and actually crawls around with it round his arm. He uses it to soothe mainly his back gums, and they will be the teeth coming through soon! He loves the colours and when he is a little older it will be also great to use to teach him colours and names of bugs. I find the price very reasonable at a RRP of £3.99. Its also won the award - Practical Parenting Silver Award Winner 2010/2011 for toys under £20. The Nuby Nibbler is my favourite product. It is a very clever product that is very unique. When Maxwell started teething properly we got it out and Maxwell first had ice in it, this soothed his gums very well. It's great for soft fruit like banana and stewed apple, but today we put frozen puree in it as well as ice and also some tinned peaches which are Maxwell's favourite as he loves sucking the juice out of them. I would also recommend this if your child has difficulty holding pieces of fruit as i know some are to slippery to hold and this is ideal for the baby to hold and feed themselves. The only thing i find is the safety catch is a bit fiddly, however once you have done it once you get the knack of it. This is certainly not going to break your bank balance at a RRP of £3.99 and coming in such a great range of colours that are bright and cheerful for your child, they are suitable for all children! The Nibbler is easy to clean with all parts coming off separately. The nets need to be replaced occasionally however you are able to buy replacement nets if they are needed. I can't recommend this Nuby product enough. This product is BPA free. We both love this teether! It is a simple design but works well. I've been putting it in the fridge for half an hour before I give Maxwell it and he loves it.This teether is great as it is made up of hard surfaces to chew on, as well as a different set of textures such ridges and raised dots. I use the keys now and again to put a little treat on for Maxwell such as some purred fruit, he adores this but things can get a little messy! The keys are a great shape for Maxwell to hold. Maxwell never has a problem moving them round his mouth and enjoyed sucking and biting them. Maxwell enjoys biting the gel bit more than using the hard bits to chew on. This product had a RRP of £4.99 which i again think is cheap. This product is BPA free. Its also won the award - Practical Parenting Bronze Award Winner 2009/2010. To view Nubys range please click here. Great blog post and what a cute baby - love your blog photos! 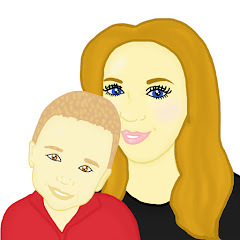 It is lovely to read a blog from a young parent, you definitely add something different to the blogging world! You are doing a great job. Your blog post are always very informative and i love the pictures of your son. I have actually gone out and brought my daughter Nuby products due to your video. Great job!